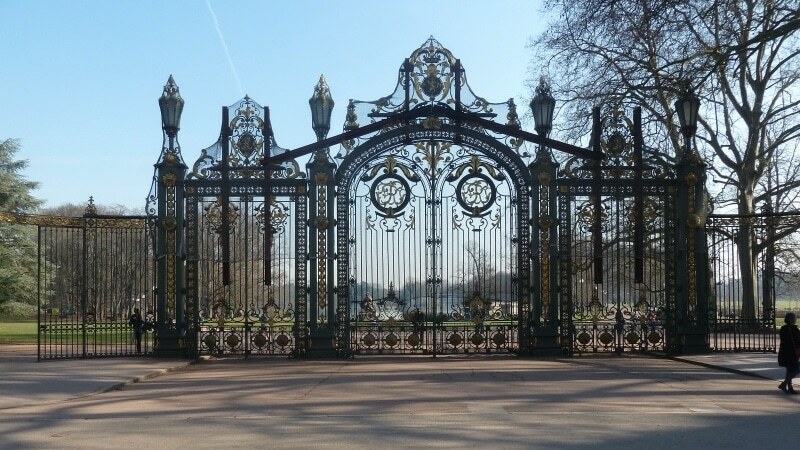 The classic gate at the Parc de la Tête d’Or’s main entrance is undergoing a massive renovation to restore its integrity and increase accessibility. Lyon’s Parc de la Tête d’Or is without its prized entryway for the forseeable future, as work begins on the “Portail des Enfants du Rhône” on the banks of the river. The gate is the main entrance to the park, impressing visitors with its ornate gold detailing. Reinforced by metal bars for many months, June 4 marks the beginning of a full-scale rehabilitation, to last through the first part of 2019. The “Portail des Enfants du Rhône” is one of the main and busiest entrances into the Parc de la Tête d’Or. The Portail des Enfants was first built in 1902 and is made up of wrought iron, cast iron, and bronze. Over time, the metal has started to corrode and crack, while the paintings and decorative details degrade. The entrance includes three different gates bordered by secondary fences that allow pedestrian access to the park. One of the most impressive park entryways in France, it is a monument in and of itself and will be restored with its authenticity in mind. The €1.2 million rehabilitation will also allow for better traffic flow and more accessibility through one of the park’s busiest gates. A temporary entryway is in place throughout the duration of the work. at efficitur. quis dolor. facilisis accumsan Aenean Phasellus adipiscing ipsum consequat.